Yerevan (AFP) – Opposition demonstrators blockaded government buildings in Armenia’s capital Tuesday as parliament was set to confirm the pro-Moscow former president as the real power in the country. Parliament is expected to elect ex-president Serzh Sarkisian as prime minister under a new parliamentary system of government that will allow the 63-year-old to maintain his chokehold on the country. The ruling party pressed ahead with the vote despite opposition rallies that saw several dozen protesters hurt in clashes with police in the capital Yerevan on Monday. Protesters blockaded the entrances to government buildings housing the foreign ministry and the central bank, among others, and rallies were also held in the provincial towns of Gyumri and Vanadzor. The opposition says the new parliamentary system of government will allow Sarkisian to maintain huge influence. Sarkisian ended his second and final presidential term last week. “I am standing here today as a leader of the party which can ensure a harmonious cooperation between the executive and legislative branches of power,” he told lawmakers ahead of the vote. The country’s new figurehead president, Armen Sarkisian, was sworn in last week but his powers will be weaker under the new system of government. The rallies began on Friday when more than 4,000 people took part. 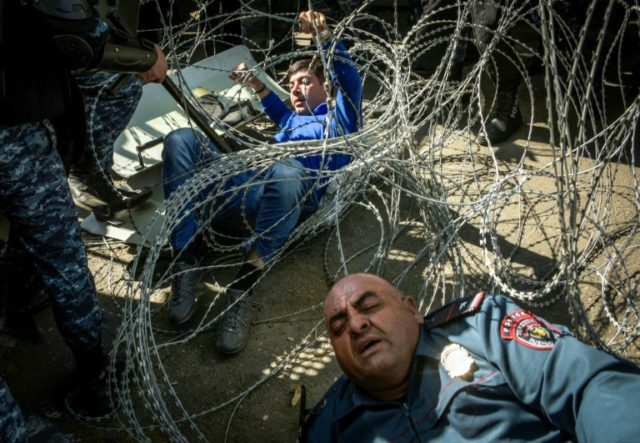 Police used stun grenades on Monday as thousands took to the streets of Yerevan. Authorities said 46 people including six police and opposition leader Pashinian sought medical help.